More than 10 million people across South Asia are battling what some officials are calling the worst monsoon floods for over a decade. Nearly 100 people have died in India in the past few days and millions have left their homes as the annual rains cause chaos. A third of Bangladesh has been affected, with three million people marooned and several killed. In Nepal, flash floods have killed at least 50 people in the last week. Hundreds of people died last year in South Asia in floods and landslides which are common during the monsoon season. But officials in some parts of India and Bangladesh say that this year's flooding is the worst they have seen in more than a decade. "This is the worst flooding in recent memory with 22 of the 24 districts in Assam under floodwater," Chief Minister Tarun Gogoi said in the Indian state of Assam. "The high water current has washed away rows and rows of villages. The condition of the people is really devastating," he told the AFP news agency. State officials say 51 people have been killed in the floods in Assam - 35 of them villagers who drowned when their boat capsized on the flooded Brahmaputra river on Sunday. A breach in a dam in neighbouring Bhutan has led to massive floods on rivers flowing into Assam. Emergency officials say bad weather and a shortage of boats are hindering rescue operations. 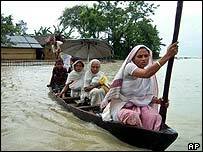 The federal government has released nearly two billion rupees ($43.5m) for flood relief in Assam. The state's famed tea gardens have been flooded, as has a game park containing 1,600 rhinos. 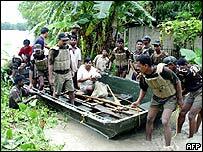 The floods have also affected more than four million people in the northern Indian state of Bihar where at least 40 people have been killed. Hundreds of army and paramilitary forces are taking part in the relief operation there, and officials say that road and train links have been totally destroyed. Thousands have taken shelter near railway stations as relief teams drop food and emergency medicines from the air. In Bangladesh, the north-east has been the worst affected with three million people marooned and thousands of others cut off from their villages and searching for shelter. Parts of the city of Sylhet - cut off from the rest of the country - are knee-deep in water. Officials in Sylhet say the flooding is the worst since 1988, when two-thirds of the country was submerged. But in Nepal, the floods have started receding after a week of heavy rain. Thousands of people have been displaced across the kingdom. Even as parts of India have been hit by heavy monsoons, other parts of the country have received very little rain. Reports on Tuesday say that senior government officials are already preparing for what appears to be the first signs of drought in parts of north and central India. The cabinet secretary is holding a high-level meeting on Tuesday to plan contingency action if the situation continues to deteriorate. India was hit by a massive drought in 2002 and officials say that they want to be better prepared this time. "The worst flooding in over a decade"